The Midwest is known for its breweries, and every brewmaster from craft beer makers to the big brands have needs when it comes to commercial water services. Reliable Water Services provides commercial hot water equipment for rental, as well as service and repair and serves breweries throughout the Midwest. Breweries and beer makers know just how important the water industry is to their craft–from cleaning taps, to brewing to finding the right balance to compliment hops and other ingredients. Reliable Water Services can help you navigate the “waters” of beer making by providing repair and replacement services. If your Brewery runs into a issue with your water heating system, don’t wait and let your taps run dry–call today and see if we can assist! Taprooms, small scale craft breweries and large operations have different needs and we can assist you with your individual operation and keep your patrons raising a frosty glass and enjoying all the beer your brewery has to offer! High gravity beers are the one-of-a-kind brew you’ve been searching for. High gravity beer provides a playground of elements for craft brewers. Some brewers enjoy the challenge of balancing ingredients to break into new beer categories, while others revel in experimenting with add-ins to create unique tastes. The latest trend that’s catching the fancy of mad brewing scientists is “big beers,” a.k.a. high gravity beers. These high-alcohol beers feature distinct flavors establishing the style as a leader amongst craft ale. This complex beer is a fun challenge to brew and an impressive addition to your unique brew offerings. A perfected milk stout beer recipe is a must-have beverage on your craft brewery menu! Looking for a fun dessert drink or a new flavor to round out your craft brewery menu? Look no further than the milk stout beer. This beer is gaining in popularity thanks to delicious flavors that appeal to a wide variety of beer drinkers. If you’re ready to try something different in your brewing repertoire, here’s a case for trying your hand at brewing a creamy milk stout beer. Want to spice up the seasonal beer game at your brewery? These stellar food and brew pairing options will keep your customers coming back for more. A top-notch seasonal beer selection is a fun way to attract new customers and keep your regulars happy. The best part about seasonal beer? The unique flavors often pair well with food. Try these appetizer, lunch, dinner, and dessert ideas to complement each brew on your menu. Remember, every seasonal beer has its own flavor profile and a great way to highlight those notes is with a delicious dish from your menu. Craft beer lovers that visit your brewery will appreciate your insight and suggestions on food and drink pairings! Calling all zesty food fans out there! Spicy beer is here and packed with kickin’ chili pepper flavors you’ll love! First inspired by the classic Mexican drink, the michelada, spicy beer is a cold and refreshing beverage with a distinctive heat. Craft beer drinkers all over rave about the spicy beer’s intense essence and rare combinations. From roasted chipotles to jalapeños and liquid smoke, the flavor profile of a classic spicy beer takes your craft brew game to a whole new level. Satisfying your sweet tooth is extra refreshing with a tasty oatmeal stout! First introduced in the regions of England, oatmeal stout has grown in popularity over the years. A deliciously creamy beverage, oatmeal stout is different from other stout brews with a distinct milky-malt taste. This is a beer that could pass for a decadent dessert. Inspired by sweet treats, the types of oatmeal stout brews range from red velvet cake to Oreo cookie. Despite its fun flavors, this is a beer that aficionados still respect. Here’s why you should add oatmeal stout to your brewery menu. With the autumn upon us, now is the time for breweries to showcase their seasonal beers like the one-of-a-kind pumpkin ale! First introduced in the 18th century, the American-born pumpkin ale has been a crowd pleaser for many years. Craft beer drinkers appreciate the flavors of this festive autumnal brew, packed with different spices. Pumpkin ale offers a variety of flavor interpretations from hints of pumpkin pie to Thanksgiving-in-a-bottle. This unique profile makes this beer a beloved and festive seasonal beverage. Lakefront Brewery is a thriving and beloved brewery and restaurant at the heart of Milwaukee’s riverfront. 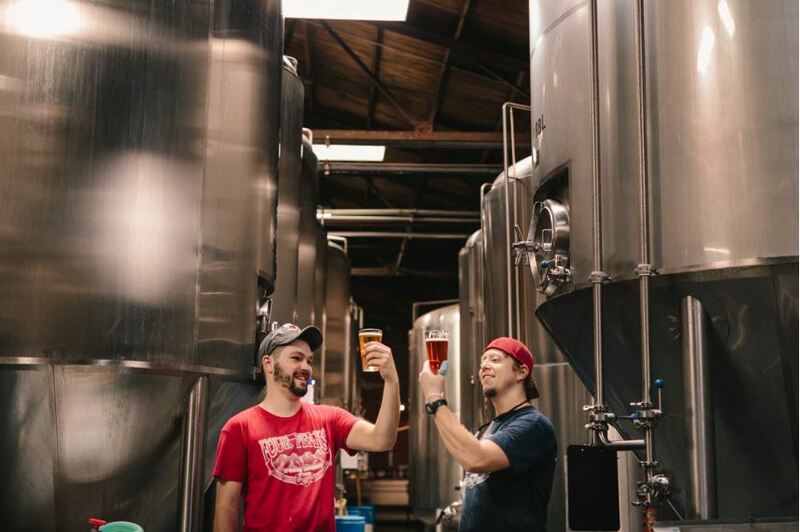 Founded in 1987 by two brothers, Russ and Jim Klisch, this iconic beer establishment has been providing the Milwaukee community with good beer, good food, and even better memories for over 30 years. Interestingly, their ever-popular restaurant, located in the brewery’s beer hall, wasn’t always part of the plan. We sat down with Russ Klisch, president and co-founder of Lakefront Brewery, and Mike Walker, Lakefront Brewery Front of House Manager to learn more about what it’s like to run a brewery restaurant business, how to create great brews, and the details of Lakefront Brewery’s journey to becoming a treasured Milwaukee staple. Running a brewery is no small job! Not only do you need to create delicious brews, but you need to attract plenty of customers to keep your business afloat. By hosting brewery events, like beer tastings, special events, and getting involved in your local community, you can promote your business and keep your brewery packed with new and returning customers. Is there really a beer that’s beneficial to your health? Read more to find out! It’s true, out of all the different varieties of brews available, a wild ale is the healthiest beer to drink today. Through a hands-off fermentation process, these sour beers offer health benefits like stress relief as well as immune and digestive system support. Every beer lover knows the struggle of enjoying their drink of choice while also maintaining a healthy body; wild fermented ales allow you to do both. Add the latest beer trend to your brewery menu. Now that summer is upon us, take a deeper look at how these tasty pale ale beers can brighten up your brewery. With spring freshly finished and summer still full of hot, thirsty days, many breweries are rolling out their saison beers. These light, effervescent beers are excellent refreshments on hot days as the temperature climbs. The key to this unique pale ale beer treat is the saison yeast and the creative additions combined with the brew. Saison beers are often where brewmasters experiment with unique tastes and ingredients creating fruited beers and chocolate ales. Customers want something light and fun during the summer; saison beer is exactly that.